We are in Soccer America! 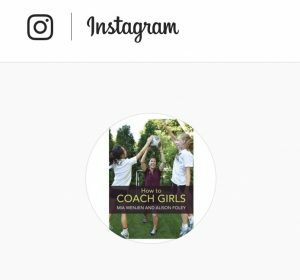 Mia: My daughter’s club volleyball coach is amazing; he thanks players for running for an out of bounds ball that they have no hope of getting. They would walk through fire for him. I asked him when we headed over to the team dinner one night if he had always coached this way. He told me that he used to be the kind of coach who was the hardest on the most promising player, but he learned that you can’t coach girls in that way. Alison: Girls want to be pushed but they need positive reinforcement. It’s important for them to feel that even when you’re pushing them, you still believe in them. Which means that you can’t just give them positive feedback at the end of practice, they need a small amount of positive reinforcement throughout practice. A female player can’t be in the unknown, she needs to be sure that her coach thinks she is good enough. You can’t assume that because she scored five goals in the small-sided game that she knows that she had a good training session. I saw this in evidence just recently in training; girls can really improve during practice if you encourage them. When they achieve something that you have been asking of them, giving them a quick boost with some praise can go a long way. Never assume that they know that they are doing well, it’s rarely the case. Once you’ve noticed a player has done something positive, compliment it right away. A player will grow from that. For example, Helena was stripped of the ball three times in practice. She needed to look over her shoulder to see pressure. As soon as she did that, BOOM! My feedback to her was: “That’s exactly the turn that I need you to do. You turned away from pressure really well.” And she didn’t lose the ball in the midfield throughout the rest of practice! What you can’t say is: “Stop losing the ball!” A response along those lines will usually result in her then losing the ball for the rest of training. As soon as she masters the skill that you wanted her to work on — it doesn’t have to result in a goal, it’s that she turned, escaped pressure, and connected a ball — you need to praise it straightaway. In my experience, she’ll then demonstrate that skill again and again. There are certain girls on the team to whom I could say regarding a 40-yard pass: “Come on, Jo Jo, you have to connect that out of the back.” We’ve built a relationship on trust, so I can send her that message in the knowledge that she knows I still value her as a player. However, I couldn’t say that to a freshman who isn’t as sure about her standing in the team. I would have to be more positive. She has to know that I am there for her, that I do believe in her, and that I think that she’s a good player. Once she trusts me, I can give a little bit more. I could eventually say: “That’s the one that we can’t lose in the back,” knowing that it wouldn’t erode her confidence. • Girls need to know that you, as the coach, believe in them. • While girls need constant feedback during practice, it needs to always be positive until a trusting relationship is established. • Once you notice a player has done something positive, compliment it right away. • Give this constant stream of positive feedback to everyone on the team, as evenly as possible. (Excerpted from “How to Coach Girls,” by Alison Foley and Mia Wenjen, Audrey Press, 2018. Foley is head coach of Boston College’s women’s soccer team. Wenjen covers education, parenting and multicultural children’s books at PragmaticMom.com. 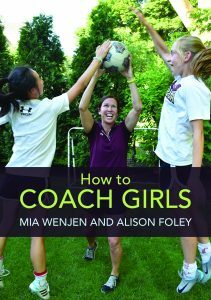 The book, which focuses on the key elements to keep girls coming back next season, covering topics like Coaching Your Own Daughter to Pitfalls of Choosing Captains to Developing Team Chemistry, is available HERE and on Amazon). 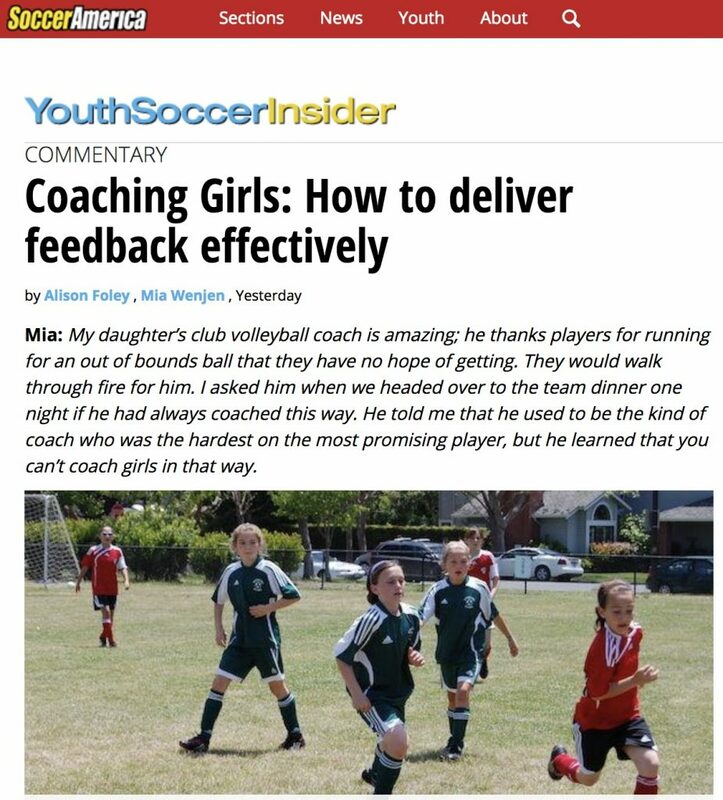 CategoriesCoaches' Corner, Coaching Challenges, How To Keep Girls in Sports, Our Book Journey TagsCoaching Girls: How to deliver feedback effectively, We are in Soccer America! Previous PostPrevious We are in Coach & A.D.!